Dr. Gary M. Levin is a Professor and Founding Dean of the Larkin University College of Pharmacy in Miami, Florida. Prior to joining Larkin, Dr. Levin was the Associate Dean and Professor for Clinical Programs at Roseman University. Prior positions include Founding Campus Dean and Professor for LECOM – School of Pharmacy, Bradenton Florida Campus; Chairman of the Pharmacy Practice Department at Nova Southeastern University College of Pharmacy; the same position at South University School of Pharmacy in Savannah, Georgia. Prior to that, Dr. Levin was a tenured faculty in the Colleges of Pharmacy and Medicine (Department of Psychiatry) at the University of Florida where he became a vice chairman for research. He received his Pharm.D. from the University of Florida, then completed a Residency in Psychiatric Pharmacy Practice at the Gainesville VAMC followed by a Research Fellowship in Psychopharmacology at the University of Florida College of Pharmacy. His first academic position was for seven years at Albany College of Pharmacy. Dr. Levin has been board certified in psychiatric pharmacy practice (BCPP) since 1996 as a member of the inaugural group to become certified. He is an elected fellow in the American College of Clinical Pharmacy (FCCP). He is a founding member and was the first elected president of the College of Psychiatric and Neurologic Pharmacists (CPNP). He completed a second term on the CPNP Board of Directors as a Past President Advisor. His first time on the Board was as part of the Founding Board. 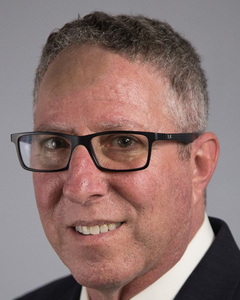 Dr. Levin has lectured at Colleges of Pharmacy and Medicine, as well as national and international meetings on various topics in psychiatry, psychopharmacology, and pharmacogenomics. He has also been a preceptor for students, post-doctoral residents, and research fellows in both pharmacy and psychiatry. This has been his greatest passion to introduce students and other learners about the impact a psychiatric pharmacist can have on improving people’s lives. Dr. Levin has been active in many professional pharmacy organizations and has held various appointed and elected positions. He served two consecutive three-year terms as a member of the Psychiatry Specialty Council on the Board of Pharmaceutical Specialties and served a five-year term with the U.S. Pharmacopeia. Dr. Levin is a reviewer for many journals in both pharmacy and psychiatry and has served on several editorial boards. He has published almost 150 peer-reviewed manuscripts, book chapters, and scientific abstracts. His research interests have included improving outcomes in patients with psychiatric disorders, pharmacokinetics of psychoactive agents, and pharmacogenomic applications in patients with psychiatric and neurological disorders. He most recently had external funding to determine what effects certain antidepressants have on P-glycoprotein, an important efflux transport protein. Since 2013, upon becoming a CEO Dean, his research interests have shifted to scholarship of teaching and learning.